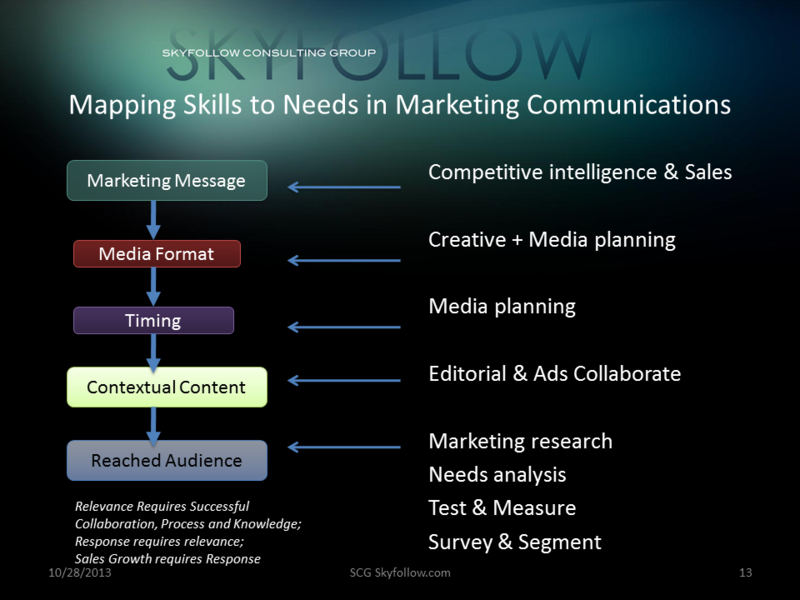 In this diagram, we see that several different disciplines work together to achieve relevance in Marketing Communications, or Advertising Strategy. Relevance is not a yet a button that you click, or an option on a targeting platform that you are using. It’s the culmination of research, planning, and execution, which must include a feedback loop into it’s own process. This is why social media can be used to support traditional advertising, and it’s why SEO works best with SEM, and why inbound marketing should fit with outbound marketing. It’s why the CMO has holistic challenges which combine the technicalities of new media channels with the wisdom of identifying the target market, the actual buyers, their mindsets, selection and evaluation criteria, and measuring the accuracy of segmenting, targeting, and messaging to allow for evolutionary improvements in response. The goal is to drive down the cost of customer acquisition, and to drive increases in purchasing, loyalty, and referrals over time. Your team should have a visual structure in their mind, in order to understand the dependencies and leverage available when working in teams with different skill sets, time horizons, deadlines, and tools available to contribute to your process.